Inviting visitors to “Plan to be Spontaneous,” Palm Desert is a great place to plan some serious shopping. In fact, “shopping” and “Palm Desert” are synonymous among Coachella Valley residents and all roads (and credit cards) lead here. 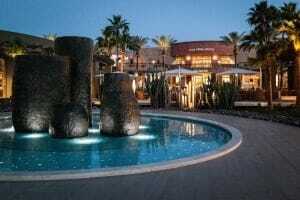 Incorporated in 1973, the comfortably affluent community of Palm Desert has a population of about 51,510 and plenty of services and attractions in addition to shops, boutiques and the Valley’s only mall—the Westfield Palm Desert. Second only to shopping, golf is the favored recreation. The public course, Desert Willow, is extremely popular, and in 2010 the 300-unit Westin Desert Willow Villas will open, bringing residents ever-closer to the greens (and the 40,000-square foot clubhouse). Palm Desert is also home to miles of hiking trails, a stunning exhibit of public art, and The Living Desert Zoo and Gardens, developed in 1970 to preserve and honor the plants, mammals, birds and reptiles of the desert ecosystem. On its 1,800 acres, including 1,000 acres of undisturbed natural desert, visitors can enjoy classes, tours and field trips. There’s certainly no shortage of culture in Palm Desert, which is known for its mid-century architectural gems, including homes and buildings designed by architects Albert Frey, William Krisel and Walter White, and the only Rudolph Schindler house in the Coachella Valley. The 1,127-seat McCallum Theatre for the Performing Arts, generously supported by some of the region’s most distinguished residents and visitors, presents a variety of dance, music and theatre events as well as educational programs and activities for children. But let’s talk about shopping. Known as the “Rodeo Drive of the Desert,” the upscale El Paseo shopping district is a dazzling mile-long collection of jewelry, apparel, art and home décor boutiques, department stores, restaurants and galleries, all fronted by glittering window displays and stylish facades. In 2010, El Paseo Village will add 40,000 square feet of shopping to this already-brimming retail neighborhood. Learn more about Homes & Condos in Palm Desert, by choosing one of the links below.